Radishes come in many colors. If you would like to know how to plant radish seeds you are in good company. Radishes, originating in China, have been enjoyed for centuries. There is even evidence that the ancient Greeks and Egyptians highly valued these crispy, peppery roots. You can enjoy them too, fresh from your own garden. There are literally hundreds of varieties of radish. Far more than you will ever see in your local grocery store. They come in a wide range of colors and shapes. Some a very mild while others will make your eyes water. Usually, radishes are divided into spring and winter varieties. You will enjoy trying both; with such a compact little vegetable you can easily find room for several types. The difficult job is deciding which pretty variety to try first. You might start with the red and white, slightly elongated French breakfast radish or the round scarlet globe. Other unique varieties include lady slipper with its pink skin and white flesh, the long, white white icicle or get loads of color with an Easter egg variety. 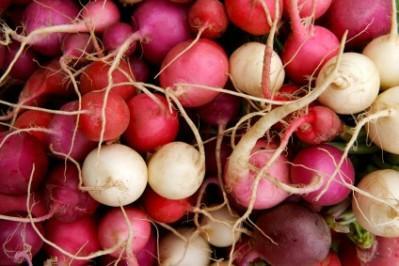 This variety gives you a mixed assortment of pink, rose, white, purple and red radishes. As you learn how to plant radish seeds and gain confidence in your gardening abilities, you'll be ready to try the many varieties available in seed catalogs. Be warned though: you may have a difficult time choosing your favorite. Radish seeds do best in cool weather, just as radish's cousins, cabbage and broccoli. Select an area that gets at least six hours of sun each day. Seeds can be sown directly into the prepared ground but also do very well in containers. This is a great option if you don't have garden space. It is important to have well-drained, rich, loose soil to plant your seeds. A pH of 5.8 to 6.8 is ideal. Soil should be tilled six to 18 inches deep, depending on the type of radish you are growing. Amended the soil, if necessary, with organic compost but avoid using fresh manure or fertilizers with a high nitrogen content. Nitrogen produces nice foliage but does little for the roots. Since the roots are your goal, you want them to develop well. Make sure the soil is loose, with no rocks or other obstructions. This allows the roots to grow to their proper size without any barriers. Small spring radishes should be sown about a half inch deep and one inch apart. Larger or slow growing winter radishes need to be a bit deeper. Anywhere from three quarters of an inch up to an inch and a half is a good depth; check your seed package for specific planting depths for the variety you are growing. Radish seeds usually germinate within a week. Once you see the seedling bursting through the surface of the soil, they should be thinned to about two inches apart. Winter radishes may need to be thinned to a six inch spacing. This will give your radishes enough room to grow without crowding. After seedlings are thinned, they need to be mulched. Mulching helps keep the soil temperatures cool and also helps to retain moisture. It can also allow you to keep your winter radishes in the ground a bit longer if they aren't yet ready to harvest. A mild frost tends to improve the flavor of winter radishes. They will not survive a hard freeze however, so be sure to harvest them before this time. Harvest when roots are young, about an inch in diameter or less. Leaving them too long will result in hot, woody roots. Learning how to plant radish seeds is a great project for beginners. Children will enjoy the quick progression from planting to harvest as many varieties are ready to pick about three weeks after planting. What a great way to get your kids outdoors!.